^ From left: Paudi Reidy (Operations Director, Select Roofing); Patrick Monhan (Comedian, and MC of the Awards Ceremony); John Kinsella (Managing Director, Select Roofing); Dr Joerg Schwall (Managing Director, Kalzip Europe/Middle East). 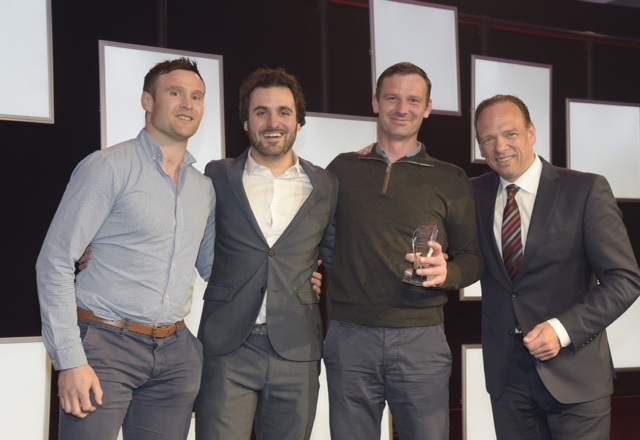 Expert roofing specialists Select Roofing have been honoured as being among the best in the business, by taking a major prize at the annual TeamKal/Kalzip awards ceremony. Meeting the challenges of such a diverse portfolio of work enabled Select Roofing to take the award, in the face of strong competition from other nominees. The TeamKal awards reward the companies and projects that the judges feel have excelled most in their field. The unique partnership between TeamKal and Kalzip puts contractors at the forefront of the industry and recognises each for technical excellence, quality products, installation, and best practice. The award came as Select Roofing continued to enjoy a period of great growth and success, as it was also the winner of an Icopal award for ‘Best Roof of the Year’ in Ireland. It was presented at the annual Kalzip Conference, held at the Carden Park Hotel in Cheshire, where delegates also heard about developments in the industry and where Kalzip were celebrating the installation of an incredible 100 million square metres of roofing worldwide. Select Roofing’s Managing Director, John Kinsella, expressed the firm’s delight at being so honoured, and thanked everybody responsible. ‘We are delighted to receive this award in recognition of the quality of our work and our dedication to excellence,’ he said.